Police have advised people to avoid the area and will release details of the casualty bureau as soon as possible. 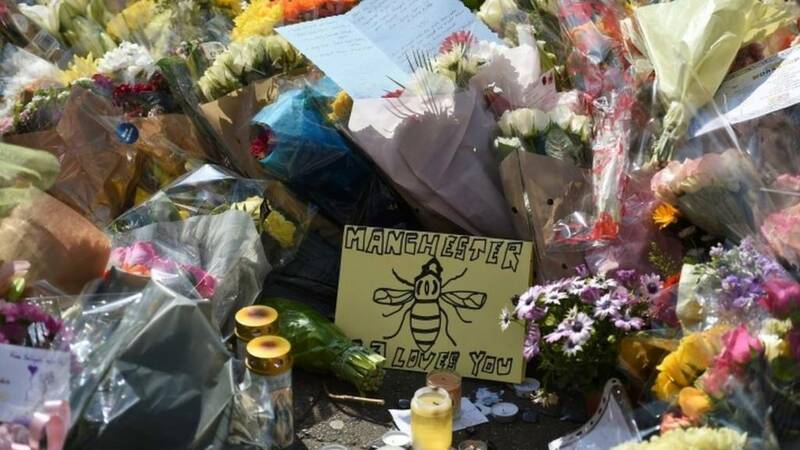 Pat Carney, the council's spokesman for the city centre, said everyone's thoughts were with the families of those killed and injured. "It's a very easy target - a concert hall where young people are enjoying music," he said. "The public are really co-operating by staying away from what is basically now a crime site. "The world we live in, police and the council have emergency procedures that we practise all the time. "The police are treating it as a live site, we don't know if this is the end or there are other incidents in that area... we don't know at the moment." Guardian journalist Frances Perraudin has tweeted this video of a Royal Logistics Corp bomb disposal unit in the area. Jade Baynes, who is from Hull, said she was told to run by armed police after leaving the arena. The 18-year-old said she heard loud bangs and what sounded like gunshots just after the concert had finished. She added: "There were just a loud bang and a flash and everyone tried to scramble out. "An alarm came on telling everyone to stay calm but leave as quickly as possible." British Transport Police have issued a statement saying its officers had responded to reports of an explosion in the foyer of Manchester Arena. A number of people living in Manchester are offering accommodation to those who have been stranded in the city, using the hashtag #RoomForManchester on Twitter. Concert-goer Josh Elliott, speaking to BBC Radio 5 Live, described what happened inside the arena as the gig finished. "A bang went off and everyone stopped and screamed... we basically hit the deck," he said. "We got up when we thought it was safe and got out as quickly as possible. "People were just crying and in tears... police cars were everywhere." "We just wanted to get out as quickly as possible because we didn't know what was going on." Michelle Sullivan, from Huddersfield, was attending the concert with her daughters, aged 12 and 15. "It was really scary," she said. "Just as the lights have gone down we heard a really loud explosion... Everybody screamed. "When we got out they just said 'keep on running, keep on running'." A spokesman for singer Ariana Grande, who was performing at the arena, has said she was OK.
A Twitter user posted a video of Manchester Arena following reports of a "huge bang". Police have confirmed a "number of fatalities" following reports of an explosion at Manchester Arena. Witnesses reported hearing a "huge bang" following an Ariana Grande gig at Manchester Arena. Network Rail said train lines out of Manchester Victoria station, which is close to the concert venue, were blocked. Greater Manchester Police tweeted to urge people to stay away from the area. Follow key updates from the scene here. The man who killed 22 people in a suicide attack had recently returned to the city from Libya. Security is increased to protect key sites following the Manchester Arena bombing. People of Manchester talk of their shock and determination to unite together through their grief. People at the scene say the arena attack was "like something out of a war film".